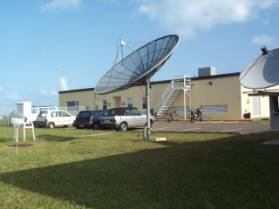 The Bermuda Weather Service (BWS) is a section of Bermuda Airport Authority’s Aviation Services Delivery Unit. The BWS has evolved substantially since its inception in 1995, following the departure of the US Navy, which previously provided a skeleton meteorological service for the Island, in addition to their own operational requirements at the former Kindley Field US Naval Air Station airfield, now known as the L. F. Wade International Airport. The BWS is officially recognized as the island's National Meteorological and Hydrological Service, providing public, marine, tropical and aviation weather forecasts, warnings and climatological services. The BWS Director manages the service along with the Deputy Director, a Senior Technician and an IT Systems Administrator. The 24-hour operational weather service has a staff comprising of five Meteorologists (Forecasters) and five Meteorological Technicians (Observers). Inexperienced trainees undergo training and certification in close coordination with the Met Office, UK, in addition to rigorous in house training at BWS. The US National Weather Service and the United Nations World Meteorological Organisation also provide specialist forecaster training at the National Hurricane Center in Miami Florida. The BWS supplies weather information to the media, including two local weather-dedicated TV channels and a variety of marine users, including the many visiting yachts. Bermuda Maritime Operations Centre staff relay our forecasts on Marine VHF radio, weather channel 2. The BWS works in close liaison with Bermuda's Emergency Measures Organisation and the US National Hurricane Center. The BWS also operates a comprehensive web site www.weather.bm which is extremely popular with both local residents and visitors. To promote awareness about weather phenomena, BWS hosts tours and endeavours to educate the community by means of public presentations. Operational staff at the BWS gather information from a variety of sources. International weather observations, bulletins and World Area Forecast System products are obtained via the UK Met. Office, and U.S. National Weather Service. Due to the sparseness of marine observations from the surrounding ocean, forecasters in Bermuda have to place much reliance on the various numerical weather prediction models, imagery and other products from geostationary and orbiting weather satellites. Computer model data and observations are processed and displayed on Visual Weather workstations, supported by both the UK Met. Office and IBL Software Engineering. Observers take surface observations at least every hour, provide synoptic summary observations every few hours and release a weather balloon for radiosonde observations at least once a day. Weather radar capabilities at BWS were upgraded to an S-Band Doppler radar system in August 2005. This system facilitates the improved tracking and prediction of weather systems, including hurricanes, winter storms and other severe weather types. In addition to the radar, automated weather observing systems (AWOS) have been installed at various locations throughout Bermuda, and have also been providing valuable data since August 2005. Radar imagery and the AWOS data are available through the BWS website, www.weather.bm.